Wolfe is both nettled by envy and full of curiosity over Hewitt’s “freaks” as he calls them. So much so he does the unthinkable: actually leave his brownstone and brave being driven by Archie to the show to see for himself. Archie is so smitten with Anne he even claims to Wolfe he is going to marry her. Little does he know his first meeting with her will take place inside the Rucker & Dill exhibit when he notices Gould’s legs are in an odd position nor is he responsive to the playful splash of water Anne always throws on him to complete her feet washing act. Turns out he is dead, shot in the back of the head by a small caliber pistol hidden in a rock pile his head was resting on. Turns out someone had made off with Lewis Hewitt’s walking stick while he and Wolfe were haggling over his black orchids (which Wolfe wants very badly), set it up against the back door leading into the Rucker & Dill exhibit, and attached a green string connected to the hidden pistol. It also turns out that as Wolfe, Goodwin, and Hewitt were passing by in the corridor while taking a short cut to the third floor. Goodwin saw the stick, picked it up … and inadvertently shot Gould. 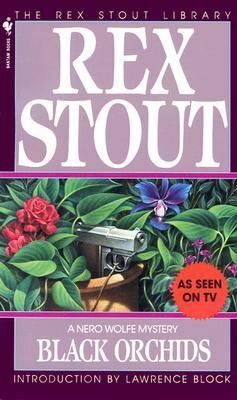 Who put it there and why is something only Nero Wolfe can unravel, but it is going to cost Hewitt his black orchids. In the second adventure, Wolfe is approached by socialite Bess Huddleston who is receiving anonymous letters and hires him to find out who is sending them. But before Wolfe can collect his fee on the matter, she is poisoned by a bottle of mock iodine which actually is chock full of tetanus that gets into her bloodstream via an tiny cut in her toe. Which member of her inner circle did it is a good question, especially since they are a kooky bunch who could have been the cousins of many of the characters from The Thin Man. Wolfe claims he is not interested in finding out whodunit, but Archie isn’t so easily convinced, especially when Wolfe sends some black orchids to Bess’ funeral. If you are looking for a couple murder mysteries narrated in a lively first-person style, you can’t go wrong with this Nero Wolfe twosome.